Earlier, I posted a slideshow filled with pictures taken on Friday, when local nonprofit Bread for the City celebrated the grand opening of their new building in Shaw. The expansion doesn’t just mean more room– it means more services for the city’s most vulnerable citizens. Last week, I spoke to Bread for the City’s Executive Director, George A. Jones about the expansion, the work his agency does and more. Part of the interview is below; look for the rest, tomorrow morning. 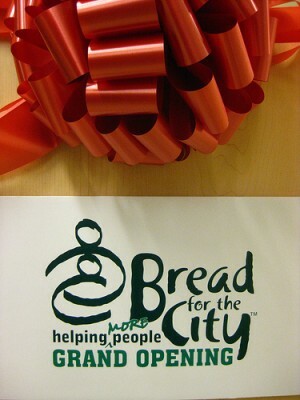 Started in 1974, Bread for the City is a front line agency serving Washington’s poor. The agency began as two organizations; Zacchaeus Free Clinic began in 1974 as a volunteer-run free medical clinic, and Bread for the City was created in 1976 by a coalition of downtown churches to feed and clothe the poor. The two entities merged in 1995. Today, we operate two Centers in the District of Columbia and provide direct services to low-income residents of Washington, DC. All of our services are free. Our mission is to provide comprehensive services, including food, clothing, medical care, legal and social services to low-income Washington, DC residents in an atmosphere of dignity and respect. We’ve been around for 36 years; this expansion represents our commitment to providing even more services to folks living in poverty in D.C. It’s the culmination of a dream. We knew we needed to expand our center in Northwest way back in 1995, but it took a lot of planning and the right timing for us to tackle it. We started this project during one of the worst recessions…but there was a sense in the organization that the community would rally around this project because this community gets that when times are tough, our services are especially in need. There’s something just about an organization whose mission is to help those who are less fortunate. It was a community effort, a combination of public and private support that really made this possible. The D.C. government was the first partner in this project. The city used tobacco funding a decade or so ago to expand health care…they decided our project did just that. The health clinic is the centerpiece of our expansion. We had a $5 million grant; we leveraged it to attract just under $2 million from Federal tax credits and then the last $1.5 million came from private sources. It was completely a community effort: public sector, local government, federal government and a lot of individuals and foundations. It’s consistent with how we fund our mission day in and day out. We went to our partners to try and realize our dream of expanding. One of the reasons the expansion was so important is because we had maxed out on our ability…now we will be able to address more of the needs that have surfaced in this tough economy. Just a year ago, we reduced our schedule to four days a week because of our own economic challenges; we were seeing fewer people because we had to limit our service hours to make sure we could meet our own budget. An important element of the expansion is that it allows us to address the growing need for the services Bread for the City offers. We are making an investment in long-term strategy while dealing with the short-term pressures of this recession. We know the economy will eventually rebound, but when it rebounds, it’s likely that low-income people will benefit from that the least. During this recession, I thought it was more important to set the stage to do more work. I think there are going to be more people coming through our door. There are roughly 2500 people a year in our health care practice; once we grow in to our expanded facility, that number could jump to 6,000 patients. That’s what this building has set the stage for– we will be able to double the number of medically under-served people who can come to our clinic. This expansion means we can do a lot more in the coming years. Tomorrow: more about the expansion, specifically how it will impact the many services Bread for the City offers.